The Department of Homeland Security started a campaign a while back that will let people report suspicious activity to the authorities. 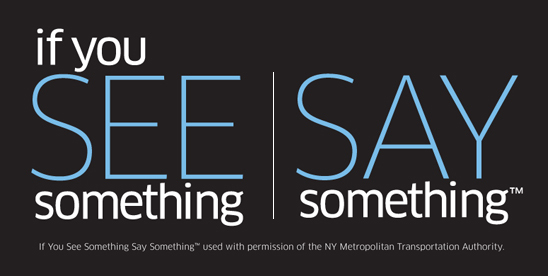 The catchy slogan they came up with is “See Something, Say Something”. Rolls off the tongue, doesn’t it? This program has its time and place. There are times when you see something going on that you definitely should say something to someone. Say, if your neighbor is buying fertilizer by the pallet. And he doesn’t have a garden because he lives in an apartment. And he drives a box-type truck. You might say something about that. But what if your neighbor is a doctor, who just happens to be a darker shade of tan than you and isn’t a very friendly person? Is that someone worth reporting? The answer is apparently yes, if you’re a police sergeant. Posted in General Griping, Law Enforcement, Social Politics and tagged ACLU, Elk Grove Police Department, Folsom, Folsom Dam, Homeland Security Department, McCarthyism, Middle East, Police, See Something Say Something, United States. Bookmark the permalink.